On the morning of Thursday, May 18th San Diegans will head to work like any ordinary Thursday, but instead of driving a car, many will be riding their bikes in support of Bike To Work Day 2017. Bike to Work Day is part of Bike to Work Month, a nationally recognized event in an effort to highlight biking as an everyday, environmentally-friendly, cost-saving and active commute option. This year, employees in Southeast San Diego will be happy to hear that a new pit stop will be located at 415 Euclid Avenue, San Diego, CA 92114. From 6:00 AM to 9:00 AM, participants can stop by on their morning commute to receive Bike To Work gear, refreshments, bike tune ups, and most importantly receive encouragement. 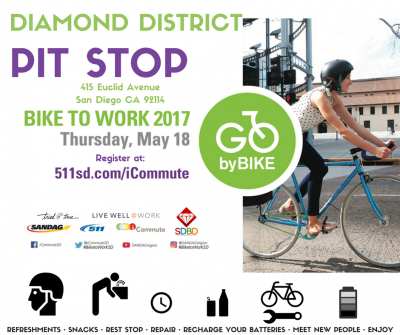 Participants in the area can register now to receive a FREE Bike to Work Day 2017 t-shirt at Diamond Business Association pit stop! The new pit spot was made possible by the Diamond Business Association with support from UC San Diego Center for Community Health Live Well @ Work initiative. In an effort to increase the accessibility to and participation in biking and walking to work in Southeast San Diego, the Live Well @ Work team is working closely with the Diamond Business Association to provide resources and technical assistance to improve active transportation opportunities and to create safe biking routes to healthy places in the area. For a full list of other Bike to Work pit stops for 2017, check out the pit stop map for locations, times, and details.